Del Duca, S. and Cai, G. (2013). Binding Assay of Cytosolic Proteins to the Cytoskeleton. Bio-protocol 3(22): e980. DOI: 10.21769/BioProtoc.980. Del Duca, S., Faleri, C., Iorio, R. A., Cresti, M., Serafini-Fracassini, D. and Cai, G. (2013). Distribution of transglutaminase in pear pollen tubes in relation to cytoskeleton and membrane dynamics. Plant Physiol 161(4): 1706-1721. Many cellular proteins interact with the cytoskeleton (both actin filaments and microtubules), either dynamically or permanently. This interaction is required during different aspects of the cell life, for example during the process of cell division. In addition, many enzymes interact transiently with actin filaments and microtubules in order to promote their cellular distribution. Several substances with inhibitory capacity can affect this binding and cause damages to cells. This protocol allows to analyze whether a protein interacts with either actin filaments or microtubules and, when applicable, the conditions controlling this interaction. The test is based on the specific binding between the protein of interest and the cytoskeletal filaments. As shown schematically in the diagram of example (see below), the test starts from the cell lysate to which actin filaments (produced from monomeric actin) are added. The mixture (performed under different experimental conditions chosen by the operator) is then incubated so that the protein of interest (in the example, myosin) binds to actin filaments. The sample is then centrifuged in order to separate unbound or weakly-bound proteins from actin filaments to which both the protein of interest and, eventually, traces of less specific proteins are associated. This step necessarily depends on the cells or tissues on which one is working. In theory, soft tissues (such as animal tissues) can be lysed directly in the lysis buffer using either plastic Eppendorf pestles or an Ultra-Turrax homogenizer in case of complex tissues. For plant cells, it is preferable to freeze the tissue of interest under liquid nitrogen and then grind it with pestle and mortar. After the tissue was completely powdered, the liquid nitrogen is allowed to evaporate. The tissue powder is moved to a suitable tube, like eppendorf tubes or 15-ml conical tubes (depending on the amount of starting material). The lysis buffer is added and the sample is incubated at 4 °C or on ice for 15 min with gentle agitation. At the end, the sample is centrifuged at high speed (> 100,000 x g) for pelleting cellular debris and for getting cytosolic proteins in the supernatant. Although the extract of soluble proteins can be frozen under liquid nitrogen and stored at -80 °C, we always prefer to work with fresh material because it is difficult to estimate the temporal stability of the extract. The composition of lysis buffer may be adjusted from species to species, please refer to the literature on the specific tissue in order to determine the best lysis buffer. Determine protein concentration of the cytoplasmic extract in order to mix known protein quantities. Several commercial kits are available for determination of protein concentration (such as the 2D Quant Kit or the Bradford Protein Assay kit). Always take an aliquot for electrophoresis. Thaw one aliquot of lyophilized tubulin (animal or plant source, 1 mg), then add 200 μl of TDB so that the final concentration is 5 mg/ml. Add 25 μl of GB and incubate at 35 °C for 20 min. Mix 1.8 ml of TDB with 81 μl of 500 μM taxol (TDB-T). Incubate at 35 °C for 15-20 min in such a way that the temperature of the taxol solution is the same of tubulin. At the end of incubation, add 1.8 ml of TDB-T to 225 μl of the tubulin sample. Mix gently. Tubulin is now in a final volume of ≈ 2 ml at a concentration of 0.5 mg/ml. Prepare additional TDB-T by mixing 1.8 ml of TDB with 81 μl of 500 μM taxol. Mix the cytosolic extract (in variable amounts, for example from 0 to 40 microliters, in order to work with a range of 10-100 micrograms of protein) with a constant volume of the microtubule sample (40 microliters). Use the remaining volume for the addition of other substances (i.e. inhibitors), and then adjust the volume to 100 microliters with TDB-T buffer. Volumes can be increased correspondingly to accommodate for different rotors and tubes. Incubate the samples at room temperature for 30 min. The test temperature can be adjusted if it is a variable examined in the experiment. Centrifuge the samples at 100,000 x g for 40 min at 20 °C over 0.5 ml of sucrose cushion buffer. After centrifugation, the supernatant is located above the sucrose cushion and may therefore be removed with a pipette without touching the sucrose cushion. Process the supernatants for electrophoresis. Resuspend the pellets directly into a denaturing buffer suitable for electrophoretic analysis (e.g. Laemmli buffer) (max. 100 microliters). Test individual fractions (supernatants and pellets) by electrophoresis (SDS-PAGE) and possibly by western blot, the latter being required to identify specifically and to quantify the protein of interest. It depends on the particular tissue or cells on which one is working. See the previous protocol for more details. Determine the protein concentration of samples using commercial kits (such as the 2D Quant Kit or the Bradford Protein Assay kit) and always collect one aliquot for electrophoresis. Thaw one aliquot of lyophilized actin (animal or plant sources, 1 mg). Dilute the actin to a concentration of 10 mg/ml by adding 100 μl of A-buffer. Remove solution from the tube (usually an Eppendorf tube) and place in 5-ml or 15-ml tubes. Dilute the actin at a concentration of 0.4 mg/ml with A-buffer (100 μl of actin + 2.4 ml of A-buffer). Incubate on ice for 1 h (agitation is not required). Add the Polymerization Inducer 1x final: 2.25 ml + 0.25 ml of actin Polymerization Inducer 10x. Incubate at room temperature for 1 h.
Mix the cytosolic extract (in variable amounts, for example from 0 to 40 microliters, in order to work with a range of 10-100 micrograms of protein) with a constant volume of the actin filament sample (50 microliters). Use the remaining volume for the addition of other substances (i.e. inhibitors), and then adjust the volume to 100 microliters with the A-buffer/Polymerization Inducer mix (which is the same buffer of the actin solution). Volumes can be increased correspondingly to accommodate for different rotors and tubes. Incubate samples at room temperature for 30-60 min. Centrifuge samples at 150,000 x g for 60-90 min at 20 °C over 0.5 ml of the cushion buffer for F-actin. Take the supernatants and process them for electrophoresis. Resuspend the pellets in 100 μl of a denaturing buffer suitable for electrophoretic analysis (e.g. Laemmli buffer). Test individual fractions (supernatants and pellets) by electrophoresis (SDS-PAGE) and possibly by western blot, the latter being required to identify specifically and to quantify the protein of interest (Figure 1). In both cases, the relative quantification of bands after western blot analysis can be performed using image acquisition systems and specific software (free like ImageJ or paid such as the Bio-Rad Quantity One). Figure 1. 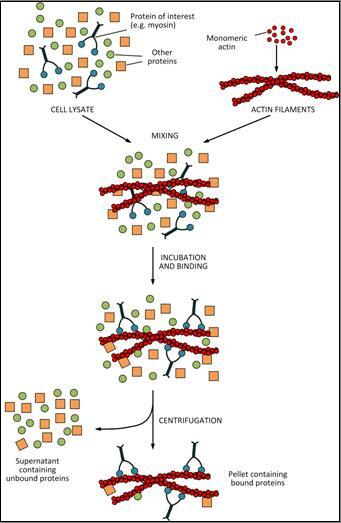 Example of binding analysis with actin filaments. Specifically, the protein myosin from rabbit skeletal muscle (arrow) was incubated with filamentous actin (arrowhead). S and P indicate the supernatants and pellets, respectively. Lane 1, molecular weight standard, the value of which is indicated by numbers on the left. Lane 2, myosin (commercially available). Lanes 3-4, supernatant and pellet obtained after incubation of myosin with actin filaments. Lanes 5-6, supernatant and pellet obtained after incubation of myosin with actin filaments in the presence of 5′-adenylyl-β,γ-imidodiphosphate (AMPPNP, a non-hydrolyzable analogue of ATP). Lanes 7-8, supernatant and pellet obtained after incubation of myosin with actin filaments in the presence of ATP. 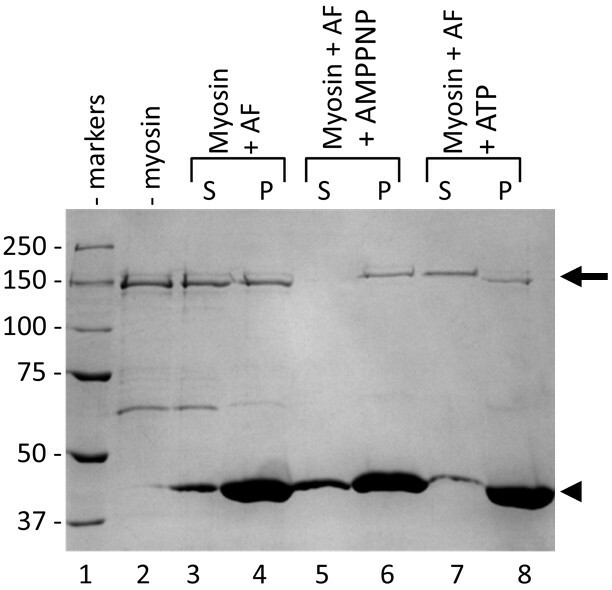 Note that myosin binds weakly in the presence of ATP but very strongly in the presence of AMPPNP. The protocol was adapted from a previously published paper: Del Duca et al. (2013). The work was supported by PRIN 2007 (grant no. 2007RZCW5S_003) and PRIN 2008 (grant no. 2008BK7RXB), funded by the Italian Ministry of University and Research, and by Bologna University (RFO 2010 [grant no. RFO10DELDU] and RFO 2011 [grant no. RFO11DELDU]) to S.D.D. Cai, G., Faleri, C., Del Casino, C., Emons, A. M. and Cresti, M. (2011). Distribution of callose synthase, cellulose synthase, and sucrose synthase in tobacco pollen tube is controlled in dissimilar ways by actin filaments and microtubules. Plant Physiol 155(3): 1169-1190. Del Duca, S., Serafini-Fracassini, D., Bonner, P., Cresti, M. and Cai, G. (2009). Effects of post-translational modifications catalysed by pollen transglutaminase on the functional properties of microtubules and actin filaments. Biochem J 418(3): 651-664. Can the polymerized actin be stored? Dear colleague, I thank you for your question. I think that the polymerized actin can be stored for one day, maybe two at the most. We usually prefer to use it fresh, but I have experienced that after one day the polymerized actin is still intact.